Releasing a game is always fraught. If you are not a game developer, or are one yet to release your first game, your only experience of it is probably watching Tommy Refenes looking sad in indie game: the movie. In reality, there is a combination of terror, worry, anxiety, excitement, fear, depression, euphoria and disbelief. As a publisher, its different, your two concerns are likely to be ‘will this lose me a fuckton of money?’ and ‘how does this affect my reputation?’. I have mitigated this a bit by firstly not spending a massive chunk of my companies money on any one game (more of it is invested in wind farms and solar parks than games), and also by constantly refreshing the page with Democracy 3’s sales figrues every day to try and trick my brain into disregarding any concerns about having a game that flops. Obviously neither tactic actually works. I still hate to lose money, and I still hate releasing a game that does not do well. The good news is that I have some data that suggests that I am making ‘good’ bets. The biggest flop I have ever released has still made me a ROI of 6% and has made a profit. Not a Great big ‘buy a ferrari’ profit, more like a ‘buy a nice laptop’ profit, but nonetheless, if even on your worse days you still make money, that’s pretty cool. The game I’m talking about, which releases in 48 hours, is Political Animals. It’s developed by these guys in the Philippines, and published by me. because I made Democracy 3, its a good fit for ‘my audience’. It’s also a political strategy game being released a week before the most high profile US election in decades. Good timing huh? Political Animals is also the latest in a long line. I learned a bit about press with Democracy 3 and Gratuitous Space Battles, learned a bit about user testing with Gratuitous Tank Battles, learned a bit about youtube, streamers and blogging with Big Pharma, learned a bit more about PR with Democracy 3:Africa, and learned a LOT, a real LOT about advertising with further promotion of Democracy 3. In short, I have gathered a lot of experience about what should work, and what might work, and what does not work. Of course, there are no guarantees, which is where the risk and anxiety comes in. Maybe people are sick of politics now? Maybe the game has bugs we are yet to find? Maybe we are releasing at the wrong time in the year? Perhaps it just does not resonate with the audience? Perhaps we spent too much money on localization and testing, and spent too much on shows? nobody will know until about midnight on Wednesday. I have to admit, I love it. I love the idea of ‘calculated risk’. I am VERY happy to take an enormous risk if the calculations in my head say that it is worth it. I’ve invested in Ukranian Iron Mines (fail! ), Companies that print dates on eggs (not bad! ), Israeli share trading platforms (fail! ), Short-selling bitcoin(fail! ), robotics(Woohoo!) and even some leveraged stuff that accelerates the factor by which you win and lose. I like calculated risk, its exciting. it’s an adrenaline rush. Its much more fun, and less terrifying when you don’t have a mortgage though. Spare a thought for Ryan & his chums at squeaky wheel on Wednesday. Its a big day for them. And check out the game, it really is rather good indeed. If you are press and need a steam key email me, and there is a rather awesome press kit with details, descriptions, screenshots, logos and character art here. I took some time today to do another short video talking about what I’ve been working on re:production line. There will be more ‘feature-rich’ videos coming over the next few months. I’m getting quicker and more organized about the whole youtube thing now :D. I am really interested to hear peoples comments and ideas about any aspect of the game. Enjoy! I’d like to run 24/7 surveillance on you. Hi. I’m a huge company. A global mega-corp. I am at the cutting edge of data gathering, of customer information processing, and I have an R&D budget of billions. I already know your name, your home address, your bank details, and probably your work address too, plus your phone number(s), obviously. By looking at what you buy from me, I can work out if you are single, live-alone, if you earn a lot, or very little, what technology interests you, probably what political views you have, if you have pets, how old you are, how often you stay in at night. I can make an educated guess as to your sexual preference. I also know about a lot of the TV shows you watch when you watch them, and all the ones that you watch multiple times, and the ones you quit watching after 1 episode. I know about virtually every book you have written, and in many cases I know what you thought of them. When you read some of those books, I know which page you got to before you quit. I know your reading speed, and I know which words you had to look up. BTW I also know when you are in another country, because you take me with you. I know when your house is empty. That time you got pregnant, I knew because of your purchases, and the sadness of your miscarriage, I know about that too because of that book you bought to help you deal with it. I know about all those wedding presents you got, and who bought them for you, and I know about those birthday presents you ordered for other people too. I feel I want to know more about you. I would like you to install a microphone in your house for me. It will be on 24/7 and record everything you say. There are terms and conditions and legalese of course, but you wont read them, and how will you know if I stick to them anyway? If you talk to your loved ones in the evening about a relative and how they seem ill, I can make a note of that, work out who is, and sell that information to their insurer. How will you ever know? If you and your partner argue in front of of me (and you will), I can sell that information as well, maybe to one of those infidelity dating sites. How will they ever know? Don’t worry, I secure all this stuff really well. Internet company databases never get hacked. Never. Anyway, I’m available now, from amazon, called alexa. No, I’m not free, not even to prime members. Thats what George Orwell imagined. This isn’t 1984, its 2016 and you get to pay money to let people put an unaccountable microphone in your living room. Ultimately though…that’s the sign of a good strategy game. Games are all about emotion (at least the good ones are), and Political Animals feels a lot like Democracy 3 in the way you find yourself constantly thinking ‘hmmmm’ and suffering from the fear of making the wrong move. Thats basically the sign of decently balanced strategy, and chess is the ultimate example of it. The only question is does the agony of tough decisions come across in a video? possibly not, and its obviously much harder to make a hit indie game when your game is less ‘youtube friendly’ than the average indie title. As a result of that drive towards ‘streamable fun’ games, we get a lot of ‘wacky’ titles featuring goats, or people in showers, or silly farm machinery getting stuck, and whilst all of these are good fun, and the videos can be truly hilarious, I wonder if the experience of play really lives up to the experience of watching from afar. Ultimately you earn money from customers, not from people watching streams. Look at it this way, would you sit and watch a three hour chess game on youtube? Me neither, but its clearly a brilliant game, and 100% absorbing as a player. Thankfully, Political Animals does not look like chess, in fact I love the way it looks, but in this day and age as a publisher you always have to be carefully balancing the ‘video and screenshot appeal’ of a game (which gets it noticed) against the ‘actually fun to play’ appeal of a title. I think PA gets it about right. 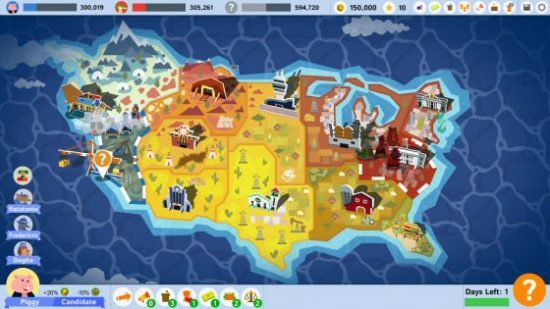 Democracy 3 looks less fun than it is, and I suspect, if peoples opinions and purchase decisions are accurate, GSB2 looks more fun to watch than to play? It certainly makes for some very pretty videos. In any case, its one of those things that an indie in 2016 has to worry about, which an indie in 2010 never cared about. This industry is always changing, with business models, prices, distribution channels, and ways to reach potential buyers in a constant state of flux. Its not for the feint-hearted. One of the major design elements in Production Line is the idea of vertical integration. Put simply, vertical integration is taking all the various steps in the production chain for a product and taking them in house. Its like Steam making the games as well as selling them, and owning the data centers, and owning the networking infrastructure too, and owning a payment processing company etc. The theory is that money is made by everyone in the production chain. In car-specific terms, the people who own rubber plantations make a profit. They sell the rubber to an exporter, who makes a profit. he delivers and sells the rubber to a tire factory which makes a profit, and they sell tires to the car maker, who is then paying for all of that. In theory, owning everything (including the plantation) helps you both capture all that profit, AND simplifies your logistics. your supplier isn’t going to go bankrupt or mess you around, or have problems anticipating your demands when you own them. In theory. Henry Ford (he of the original production line idea) took this to extremes. He did indeed buy rubber plantations (although that was a disaster) and he expanded his factories to the extent that eventually just raw materials (wood, steeel, glass…) came in one end of the factory and finished cars rolled out ton the other end. 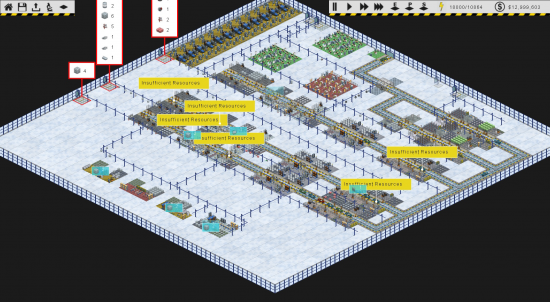 This is a major undertaking, but also I suspect a pretty cool element to build into a tycoon game such as Production Line. In the screenshot below (click to enlarge), I have my first steps at this. I haven’t gone as far as smelting steel yet, but the layout shows 3 main car production lines going from top left to bottom right, and at the bottom left of the screen is a collection of 4 different manufacturing slots. these slots are making car doors, car roofs, car seats and wheels. The very same over-head conveyor system which delivers components and raw materials to the production line slots is also used to ferry completed seats, wheels etc from those slots to wherever they are needed within the factory layout. I haven’t decided how best to refer to the idea of making stuff inside the factory as opposed to buying it in as components. Maybe ‘Local Production’, Maybe ‘Internal Production’? In any case, I hope people will see it as the natural extension of their production line as they expand towards the middle of the game, and keeps the game interesting beyond the ‘I am making cool cars now and making a profit’ stage. *it isn’t. The name of the game is Production Line.